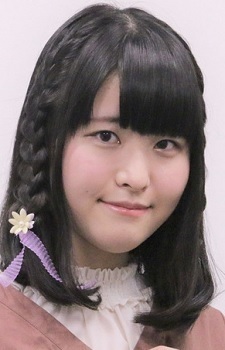 Manaka Iwami was drawn to becoming a seiyuu after seeing the performance of Ai Kayano in Ano Hi Mita Hana no Namae wo Bokutachi wa Mada Shiranai. while in middle school. Iwami was not an articulate girl growing up, so she thought she could not become a professional if she did not start studying to become a seiyuu earlier than others. She persuaded her father to allow her to attend seiyuu training school, declaring that otherwise she would not attend high school. In 2016, Iwami was selected by audition to join the cast of Sayonara no Asa ni Yakusoku no Hana wo Kazarou as lead protagonist Maquia. The film is the directorial debut of Mari Okada, who is also the screenwriter for the aforementioned AnoHana series. As fate would have it, SayoAsa would also star Ai Kayano in a supporting role, ensuring a fateful meeting between Iwami and her role model. Despite being selected for SayoAsa, that film would not open in theaters until 2018. Consequently, Iwami instead made her screen debut in 2017 in the television series Tsuki ga Kirei. I thought Hanazawa Kana was voicing Tohru. The voices are similar. So Tohru and Kyo from Fruits Basket new adaptation won on the seiyuu awards! That's awesome. omedetou manaka san! new actress award on seiyuu awards. No not Kana Hanazawa fanboying or fangirl in here. she is manaka iwami not kana hanazawa STOP IT. What a way to land your first gig, by working with those that inspired you? I'm glad she got to meet her role model!